Rick Harper is great at playing in the sandbox (or, in this case, dirt pile) with other tree aficionados. Harper, Extension Assistant Professor of Urban and Community Forestry at UMass Amherst, has orchestrated a collaborative effort between the Town of Amherst, Cornell University, University of New Hampshire, Amherst Nurseries, UMass Department of Resource Economics and UMass Stockbridge School of Agriculture students. A win-win-win-win-win-win-win. How did he do this? 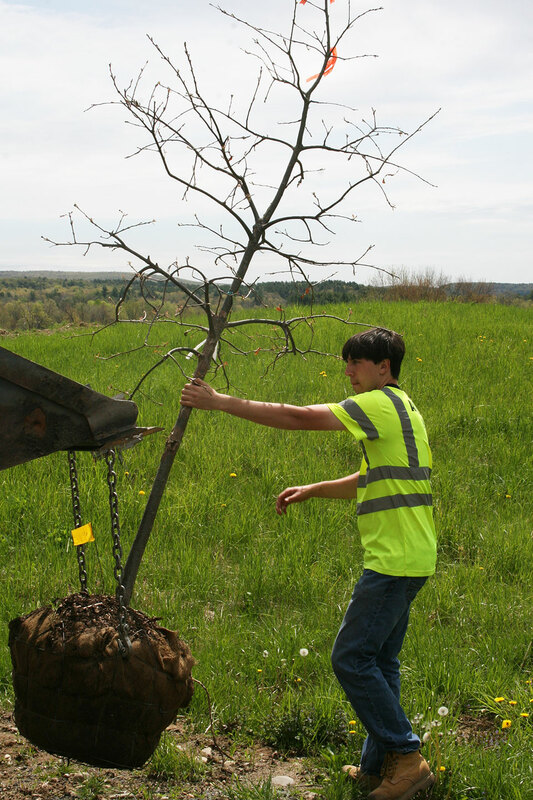 By bringing together others from the Town of Amherst, by collaborating on research with colleagues in other neighboring universities, and by educating and partnering with Stockbridge School graduates to plant and then conduct research on an installation that will total 48 trees. Last fall Harper heard from his colleague Dr. Cathy Neal at the University of New Hampshire. She had 24 swamp white oak trees that had been grown using different production methods that had to be moved from their research nursery, and thus were up for grabs. 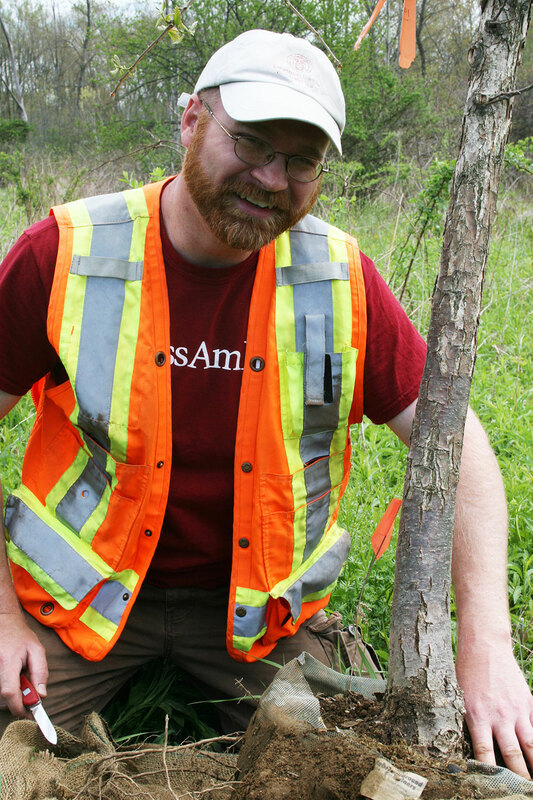 “I knew this was a great opportunity for any community that wanted to accept what equates to thousands of dollars of free plant material – all we needed was a suitable location.” Harper agreed to accept them and proceeded to work with Amherst Tree Warden Alan Snow to identify an appropriate planting site. 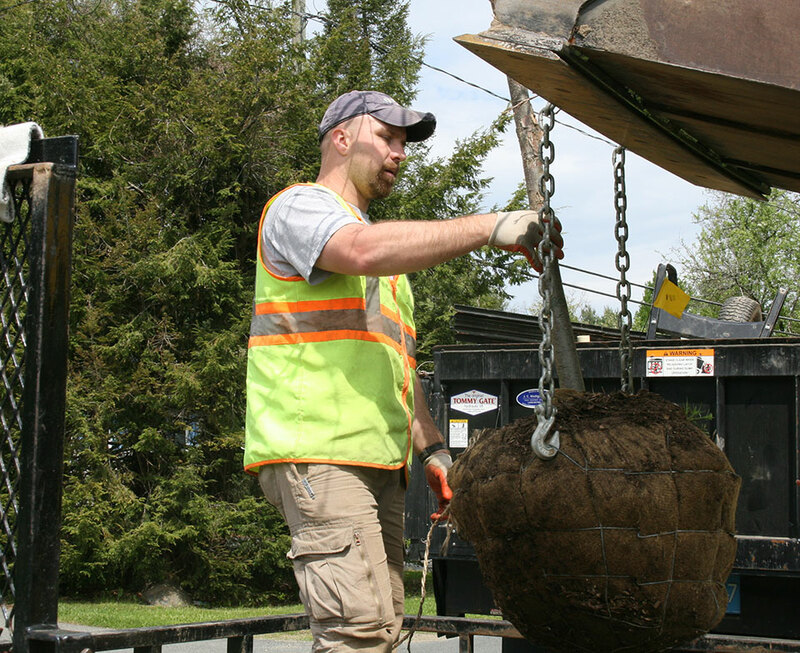 They found such a location along South East Street that offers ample room for root development and no overhead utilities that would otherwise interfere with the growth of the trees. In addition to agreeing to house the trees, Snow assigned his summer planting crew to install them. Two of his employees are no ordinary workers: Ben Green and Andy Cox are recent graduates of Stockbridge School of Agriculture as well as former students of Harper’s. Part of Green’s job is to obtain approvals from local residents; when neighbors learned about the pending plant along South East Street, they were delighted. John Kinchla, owner of Amherst Nurseries on Belchertown Road (just a mile or so from the planting site), transported the trees from New Hampshire to his Amherst location, where they were overwintered. He also supplied Harper with an additional 24 red oak trees for growth comparison. “John has been a great collaborator.” said Harper “This is a busy place this time of year and he is always supportive of our presence here.” Kinchla is also a University of Massachusetts Amherst alumnus. Although these trees should grow to be large shade trees that add beauty and help to purify the air for members of the Amherst community for years to come, their use does not end there. Harper is working with a long-time mentor and former co-worker, Dr. Nina Bassuk, Professor and Director of Cornell University’s Urban Horticulture Institute. “Before these trees are being planted, we are sampling root tissue and sending them to Cornell University for hydraulic conductivity study; we hope to better understand how water movement is influenced by transplant and in turn effects plant growth and development.” She and Harper are also examining how the different methods of nursery production – In Ground Fabric (IGF), Container Grown (CG), Balled & Burlapped (BNB) and Bare Root (BR) may influence tree establishment, growth and development over the long-term between the two oak species. Another dimension to this multilayered project will be a study pertaining to the economic feasibility of using urban trees that are grown using these different production methods with Dr. Dan Lass, Chair of the UMass Department of Resource Economics. “We’re collecting the time it takes to load, unload and plant each of these different production systems,” said Harper “each system has strengths and drawbacks.” “The use of BR, IGF and CG systems are generally limited and thus so is plant availability; their major asset, however, is that they are much lighter than a conventional BNB tree and can be moved around without the need to employ heavy equipment.” Understanding the true costs of these production methods may help encourage nursery owners to experiment with different growing systems. 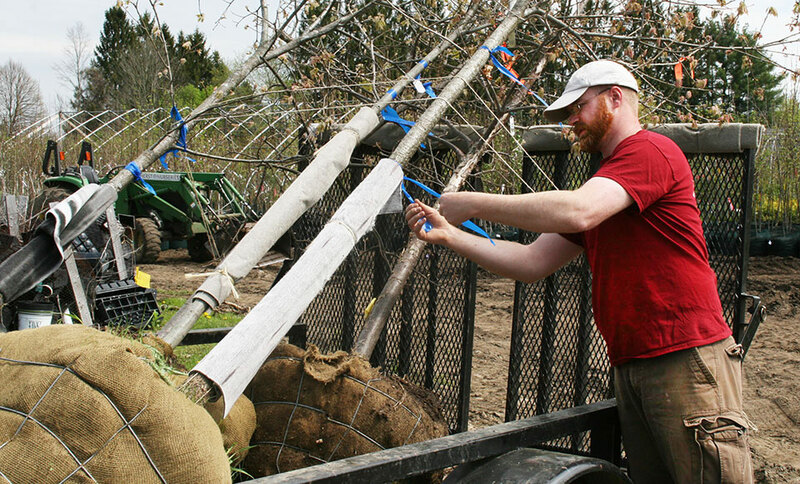 Kinchla is helping to lead by example as he is essentially converting his entire method of production over from conventional BNB to IGF at his Amherst location, in part because this system allows him to produce trees in a soil-less compost media which enables him to preserve his topsoil. With two or three research papers, a healthy collaboration with multiple universities, the private sector and the town of Amherst, this project embodies the very best work of an integrated Extension and applied research program.